re-achieved stability, many of the personnel that had sustained it during its better days were gone in search of more reliable ways of making a living. Some were permanently lost to the field. Others were welcomed back during the '60s, as the company's fortunes improved  many, especially those who had taken refuge with rival comics producers, such as DC, under pseudonyms, so as to avoid confusion in the increasingly creator-conscious fan environment. 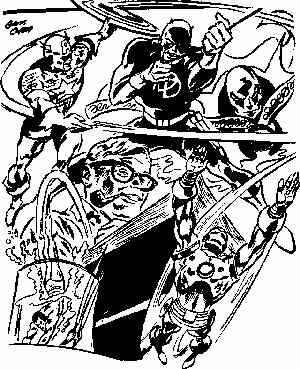 Gene Colan, for example, first entered the consciousness of Marvel's fans under the name "Adam Austin", which he used as a credit line for his artwork on the Sub-Mariner series. As Austin, Colan worked on that series from its beginning, in Tales to Astonish #70 (August, 1965), where it replaced Giant Man as the title's lead feature. At the time, his freelance work for DC appeared only in its romance line, which, while representing what had once been a major portion of the comic book industry, was by that time completely off the radar of the more vocal fans and thus caused little conflict to them. He was still using the pseudonym when he took over Iron Man a few months later, but by the time he took over Daredevil (with its 20th issue, September 1966) was signing his own name to his work. Colan's first work in comics had been at Fiction House (Firehair, Mysta) where he'd had a job briefly in 1944, while still in his teens. That was interrupted by service in the U.S. military during World War II. After the war, in 1946, he went straight into a staff position at Marvel. In '48, following an economic downturn for the company, he went to freelance status, taking assignments from other publishers as well. His work at Marvel diminished over the next few years, ceasing altogether by the time The Comics Code had been established. Additional "core" Marvel characters Colan handled after his return to the company include Doctor Strange and Captain America. He was doing Cap when The Falcon was added to the cast. Other characters he co-created include Guardians of the Galaxy and Brother Voodoo. In 1972, he helped launch the series that many Marvel fans consider the high point of his tenure there. Tomb of Dracula started with that year's April issue. Writer Marv Wolfman (Teen Titans, Vigilante) came on board a few months later, and helped make it one of the most critically-acclaimed horror-themed comic books ever, as well as the all-time longest-running comics series starring a bad guy. A few years later Colan returned to DC  this time not as an anonymous toiler on one of the less-popular genres, but as the superstar he'd become after his work at Marvel. There, he and Wolfman launched Night Force, a fantasy series in which they tried to recapture the Dracula audience. The attempt failed, but Colan still left his mark on a couple of that company's most important characters, Wonder Woman and (especially) Batman. He also made few attempts to establish new DC stars, such as Silverblade and Jemm, Son of Saturn. Since then, his work has been seen at Dark Horse Comics (The Mask, Hellboy), Eclipse Enterprises (Adolescent Radioactive Black Belt Hamsters, Zot! ), and even Archie Comics, where he did Jughead's Time Police and the "present-day" sections of the comics adaptation of To Riverdale & Back Again, a TV movie about the Archie characters 20 years later. In 2005, Colan was iuducted into The Will Eisner Hall of Fame. Text ©2010 Donald D. Markstein. Art © Marvel Comics.